Yields on U.S. corporate debt fell at the beginning of the year as investors found renewed confidence in holding the debt of American business. But the growing amount of short-term maturities is a concern should the Federal Reserve prolong its rate-hiking cycle. A more turbulent economic outlook resulted in a broad selloff of equities and corporate debt at the end of 2018. Yields on speculative-grade, or junk, bonds climbed by 228 basis points from an Oct. 3, 2018, low of 3.16% to the peak in early January, before investors started to buy back in. But the Fed's signal that it will slow its policy tightening — and warmer words between China and U.S. trade negotiators — calmed the storm that had crushed sentiment on Wall Street, and demand for debt picked up, bringing yields back down. 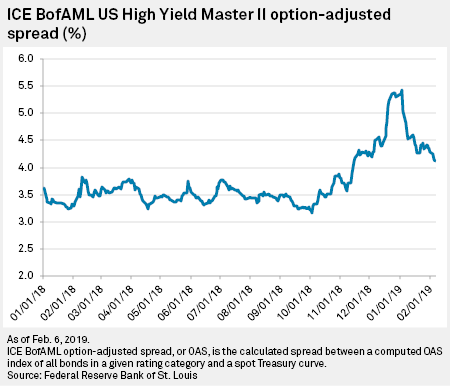 The ICE Bank of America Merrill Lynch high yield spread has shed 131 basis points subsequently as capital flowed back into higher-risk assets. "High-yield credit benefited greatly from the strong risk environment fueled by the Fed and the rebound in oil prices," wrote Andrea Iannelli, investment director at Fidelity International, in a Feb. 11 note, adding that the total return of 4.5% in January was one of the best monthly performances since 2009. "The strong weight of energy names in U.S. high yield was one of the main drivers behind the rally, with the ICE BofA Merrill Lynch U.S. high yield energy sub-index up 6.2% on the month," Iannelli said. The renewed investor confidence comes even as the rate of debt maturity in corporate America grows. Of an estimated $10.6 trillion of global corporate debt among companies rated by SP Global Ratings that is set to mature by the end of 2023, U.S. companies account for more than $4.6 trillion. Most of that is associated with nonfinancial corporates. But according to a recent report from S&P's fixed income research team, the level of maturity is manageable, while bond issuance dropped off sharply in 2018. Tighter monetary policy, volatility in stock markets, cash repatriation and global trade tensions all contributed to a slowdown in U.S. nonfinancial corporate bond issuance. Meanwhile, uncertainty over Brexit and the winding down of the European Central Bank's asset procurement program slowed debt issuance in Europe. The effect was to contribute to a 19% decrease in global rated-bond issuance, with nearly all of the decline coming from developed market economies. "We expect to see nonfinancial corporate bond issuance (including rated and unrated debt) to decline by 3% [to] 7% for full-year 2019," S&P noted. In Europe, only 13% of the debt is speculative grade, in contrast to the riskier U.S. market where speculative-grade bonds, loans and revolving credit facilities maturing through 2023 will total nearly $1.4 trillion. 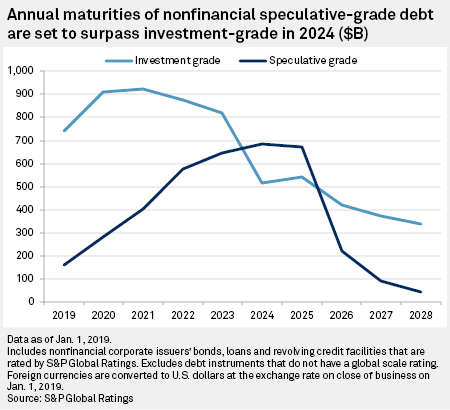 While S&P-rated U.S. corporate debt maturities will rise to $1.1 trillion in 2023, up from $670.9 billion in 2019, speculative-grade maturities will increase more sharply to $445 billion in 2023 from just $100 billion this year. "Funding conditions have been largely accommodative for speculative-grade issuers, as companies have been able to access the credit market for low-cost funding, and the loan market has provided a combination of low-cost, floating-rate debt with easier credit terms and fewer covenant restrictions than in prior credit cycles," S&P wrote. However, there are concerns over the reduction in quality of debt, and some asset managers are cautious. "The investor exuberance we saw in January has become noticeably more cautionary this week, as geopolitics have once again heightened uncertainty along with some softer looking economic fundamentals and a rather mixed set of corporate earnings," wrote Gary Kirk, portfolio manager at TwentyFour Asset Management. The proliferation of BBB-rated companies, perched on the precipice above the investment-grade cutoff, is concerning, according to S&P, due to the potential for spreads to widen rapidly in a case of market stress. "During the financial crisis in 2008, the speculative-grade spreads blew out to over 1,600 [basis points]. This occurred during a temporary drought in liquidity, when no new speculative-grade bonds were issued globally over a five-week stretch in the fourth quarter of 2008." The BBB category accounts for the largest share of nonfinancial corporate debt maturing through 2023, at 41%, or $2.6 trillion. Were these companies to be downgraded one notch, S&P warned that they could face "a pronounced increase in funding costs and a more limited pool of funding sources." In which case, yields would likely spike again.